Goddesschess: Hales Corners Chess Challenge XXV - Results for the Ladies! 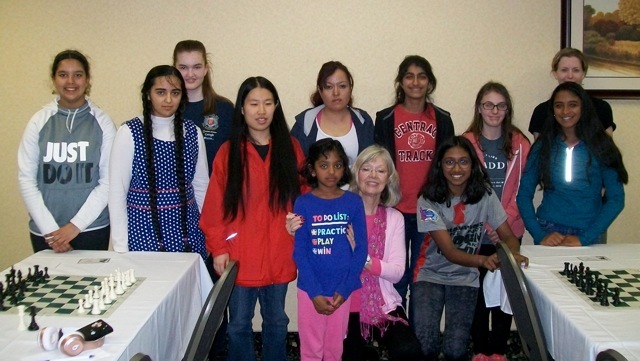 Hales Corners Chess Challenge XXV - Results for the Ladies! Hola hola on this beautiful day. The cross-table isn't up at the U.S.C.F. website yet so I don't know the individual scores, but I have a full list of the chess femmes who participated and what, if any prize money they received. First of all, a minor correction: I believe I indicated yesterday that there were eight femmes in the Reserve Section - there were actually 9. That is a participation rate of 18.9% (14/74 players). I am waiting to get a final count of the number of players, as there are usually players who register the morning of the tournament. Depending on that, the percentage may go down. However, as of now, that percentage is - as far as my memory serves - the highest yet of chess femme participation. Congratulations to the female players for turning out in such numbers yesterday for this great event. So proud of each and every one of you, and thank you for the photo!